Learn about Santa Fe, New Mexico, by reading Santa Fe, New Mexico- a City Caught in Time by Sandy Zimmerman, Travel Writer. It features a mini, but thorough tour of the destination, plus all you'll need to know to plan your trip including getting there, objective information on places to stay and eat, and things to do. At the end of the article, we've provided a summary of the contact information for your easy reference. Enjoy! 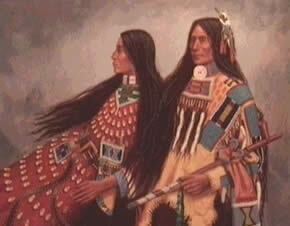 New Mexico, the land of enchantment, where Indians roamed for many centuries before the Europeans arrived. Today the beauty and charm of the past still lives in and around the little city of Santa Fe whose entire historic district is an outdoor museum, a monument to the past. We can still see the pueblos, adobe-style architecture, cliff dwellings, Native American ancient ceremonial dances, and symbols etched in rock by the Ancient Ones. Imagine, an entire section of Santa Fe holds important chapters of its history, with each turn offering colorful stories of the past. Take a self-guided walking tour or any of those provided by the city and private companies. Walk around the historic downtown streets as you would a museum, pausing at each building to feel the excitement of another era. With a multi-cultured history and such an exceptionally extensive historic district, it is impossible to include all of the historic sites. Santa Fe’s unique charm has attracted photographers, artists (Georgia O’Keefe), writers (Jack London, Willa Cather), celebrities (Julia Roberts, "Waltons" star Richard Thomas, Diane Keaton), VIP’S (Queen Noor of Jordan), and others. For ten years, composer Igor Stravinsky spent his summers working with the Santa Fe Opera company. Beginning downtown at the Palace of Governors, stroll through one of the oldest public buildings in the U. S. (1610). This was the seat of government under Spanish, Pueblo Indian, Mexican, and United States territorial rule until 1909. Currently the long, low adobe structure houses a museum of New Mexico’s history and cultures. Their print shop and bindery features 19th century printing presses and other equipment which still operate. Its front sidewalk is usually filled with Native Americans selling their arts and crafts. The Plaza has marked the heart of the city since 1610 and is where all of the East and West streets begin. Built in 1922, the beautiful multi-storied pueblo revival-style La Fonda Hotel attracted kings and movie stars (Erroll Flynn, James Stewart) in its day. The State Capitol building is designed in the shape of a Zia sun symbol, the state’s official emblem. Take a self-guided tour to see where the art collection and where the state legislature meets. Sena Plaza is one of the oldest surviving houses in Santa Fe. It’s part of a land grant of 1693, and is a former 33-room mansion built for Major Sena, his wife and their 22 children. Its thick walls enclose a courtyard, garden, shops and La Casa Sena Restaurant (see Where to Dine for a review). The Saint Francis Cathedral’s French Romanesque architecture stands out among the adobe or territorial style buildings. The San Miguel Mission Church was rebuilt in 1710, and now has a collection of antique Hispanic art. El Zaguan, an old adobe building, is an exciting example of 19th century territorial architecture. Santurario de Guadalupe, built in the late l700s, is the United States’ oldest shrine dedicated to Our Lady of Guadalupe. You can view a rare altar screen and painting of the virgin dated 1783. The Rafael Borrego House, built in the mid 1700s, currently houses the Geronimo Restaurant. It was the former residence of the wealthy Borrego family for over 75 years. Once the trails of the ancient Pueblo Indians, today Canyon Road is filled with art galleries, shops, restaurants, and the center of Santa Fe’s art colony. Plaza Mercado is an international marketplace with 40 galleries, shops, and 5 restaurants. The Museum of New Mexico includes 4 museums and interpretive centers for 5 state monuments concentrating on the phases and periods of the southwest and international culture. The Museum of Fine Arts houses historic and contemporary art from New Mexico. The Wheelwright Museum of the American Indian offers exhibits of historic and contemporary American Indian art, pottery, jewelry, rugs, baskets, and sand paintings with an emphasis on the southwest. The building looks like an eight-sided Navajo Hogan. The Georgia O’Keefe Museum is the only museum in the world entirely dedicated to the artist and her work. O’Keefe spent many summers around the Ghost Ranch, her Abiquiu home, and the Santa Fe area. She painted “her New Mexico,” the beautiful cliffs and landscapes along US Routes 285 and 84 North from Espanola. 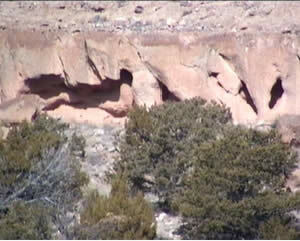 Tours of her Abiquiu home are available. Santa Fe is unique in so many ways - a place to relax, pamper yourself, and enjoy all of the delights it offers! The only Japanese health spa in the U. S., 10,000 Waves Japanese Health Spa takes you on a journey of mind and body to the seclusion of their special treatment pagodas/rooms for an atmosphere of quiet meditation, rejuvenation, and harmony. Likened to entering another world, you walk through a beautiful garden to the privacy of a pagoda where the “Thai Massage” combines yoga-style stretches, pressure points, and dynamic lengthening of your muscles. The massage is administered without oils while laying on a floor mat. Clothing is worn and the process takes 85 minutes. The therapist visits Thailand each year and is one of the leading authorities in this field. Two therapists work together during the “Four Hands, One Heart” treatment. Incredible to experience, the synchronous hands and arms flowing over your body create a heightened state of relaxation. During the Aquatic Massage, you are cradled in the arms of the therapist, your face supported above water, and moved through body temperature water. This provides the opportunity for stretches and deep work rarely achieved on land. It’s a dance; a soothing, thought-free, dreamlike interlude. Bathing suits are required. Their signature facial, the “Japanese Nightingale Facial,” uses Nightingale droppings as a cleanser and/or mask. Waves is the exclusive importers of processed Nightingale droppings, which have been used for centuries by geishas in Japan to lighten and smooth their skin. The droppings are dried, pulverized, and sanitized with ultraviolet light at the “farm;” later oils are added. Walk into the world of the Native American tribes still living in the Pueblos as their ancestors did many centuries ago. There are just a small number of these flat roofed, multilevel adobe or terraced stone dwellings still in existence. During their feast days or special ceremonies, you can enjoy ancient dances, drumming, singing, and chanting. Because the Pueblos are sovereign governments with their own laws, you are advised to call to inquire whether visitors are allowed. Eight Pueblos are close to Sante Fe - Nambe, Picuris, Pojoaque, San Ildefonso, San Juan, Santa Clara and Tesuque. Spend a few hours or a whole day. The Santa Clara Pueblo, only 40 miles from Santa Fe, shows the ruins of cliff dwellings once occupied by 1500 people from the 1100s to 1580. There are 740 rooms and a restored ceremonial chamber. Don’t miss the cliff dwellings along the road and at Bandelier National Monument. Once home of the Native Americans, you can hike, drive or climb ladders to examine the ruins. If you have time, take a vintage train ride to the historic town of Lamy or to the scenic Galisteo Overlook on the Santa Fe Southern Railroad. They offer 2 1/2 to 4 hour scenic day rides, evening cocktail, and B. B. Q. excursions year round. Blending the many cultures of Santa Fe, their restaurants are as exciting as the city. Part of the thrill of experiencing another culture is that Santa Fe keeps the traditions alive. El Farol, resembling an adobe in a classic western movie, is Santa Fe’s oldest restaurant and cantina, entertaining artists, locals and bohemians since 1835. Owner David Salazar serves award winning traditional and contemporary Spanish cuisine. Taste 30 delicious hot or cold Spanish tapas like grilled quail in espresso with a chipotle glaze, tuna ceviche in coconut milk, roasted duck in Moroccan carrot sauce and baked goat cheese with pumpkin seed flat bread. Voted “Best Appetizer” is his lobster-chorizo cannelloni. Try the famous Paella Valencia Mixta. Live entertainment is served up, too, including jazz, blues, R&B, Flamenco, and soul. La Casa Sena brings Las Vegas to Santa Fe! Billed as singing waiters, the exceptionally talented cast take breaks from their work to perform Broadway show revues nightly. There’s no cover or minimum; dine or drink while watching the entertainment. Sena offers a fine menu with international influences and a southwestern twist - Chilean sea bass, roasted chorizo stuffed pork loin with peach-onion sauce, grilled filet of beef with mushroom tomato duxelle, natural citrus marinated chicken breast with pasilla chile harissa sauce, trucha en terracotta-trout wrapped in corn husks and baked in clay. Patio seating is also available. Taste some authentic Native American dishes along with southwestern and international cuisine at the Amaya Restaurant inside the elegant Hotel Santa Fe. Mixing classic technique, contemporary flair, and fresh seasonal ingredients from traditional Native American Indian fare, Chef Dominic Geraghty creates innovative dishes. Amaya highlights local pueblo and Northern New Mexican influences, as well as regional foods from around the U.S. Featured dishes are a 12 oz blackened buffalo rib eye steak, Picuris (pronounced Pic-ur-ise) Tribe smoked tenderloin of elk, chipotle grilled quail, boar bacon broiled tomatoes, as well as lamb chops, salmon and much more. You can enjoy accommodations at all price ranges. One resort encompasses the sights, sounds and aromas of the southwest, perhaps because the Hotel Santa Fe is Native American owned by the Picurise Tribe. The entire resort expresses the true flavor of their heritage. From the moment you arrive at the strikingly beautiful earthen colored pueblo shaped building, the effect is like being transported to another world! Wood beams crossing the ceiling . . . Kiva Fireplace .. . Native American arts and crafts adorning the walls and gardens . 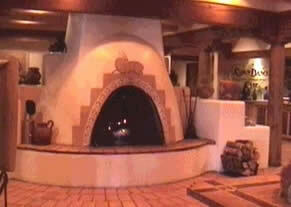 . .
Hotel Santa Fe creates an atmosphere for your enjoyment. Everything about the hotel is unique! The welcome sign greets guests in English and Picurise. Watch local musicians and storytelling around the kiva fireplace, ceremonial dances in the courtyard, and have your meeting or dinner in the teepee. Experience the beauty of a hoop dancer spinning a symbolic tale . . .the sacredness of the tribal dancers in authentic headdress and ceremonial attire . . . the notes of a wooden flute filling the lodge-style interior of the lobby . . .the timeless storytelling of the resident historian. Hotel Santa Fe is more than just a hotel; it is as unique as the beautiful city in which it is located. From the moment they opened their new $8 million addition, the Hacienda stands as a model of luxury resorts designed to provide the ultimate experience for travelers who demand the best. Set apart from the main hotel, in its own private space, but connected by a Santa Fe-style covered walkway, the Hacienda is the city’s most luxurious new hotel. Queen Noor of Jordan was the Hacienda’s first official guest, then Julia Roberts, "Waltons" star Richard Thomas, Diane Keaton, and many other celebrities. From your first step into the reception area, guests enter another culture. Along each wall are museum-quality works of Native American art, Navajo rugs, and exhibits. The reception desk? Non-existent in the traditional sense. A butler takes the information in your room. Just three stories, 35 rooms and suites, - the Hacienda retains the aura of an elegant private home. Each guest is treated like a VIP. Every room in the Hacienda has a fireplace with remote controls that allow dousing the flames from the warmth of your bed or cushioned sofa. Take their free shuttle van service to the historic downtown plaza, the Canyon Road art galleries, museums, restaurants, shops, entertainment, and all around the Santa Fe area. Discover Santa Fe where all you need to do is concentrate on enjoying yourself. I've included other accommodations in the Details Section below. Note that I haven't personally reviewed those properties at the time that this article was written. Air: Most major airlines service Santa Fe through Albuquerque with connections by shuttle, bus, or car rental. Shuttle: Take the Sandia Shuttle Express for a great, comfortable 70-minute van ride to Santa Fe. (888)-775-5696, www.sandiashuttle.com. Bus: The Greyhound Bus Company services these two cities. (800)-231-2222. Car Rental: Most major car rental agencies service Albuquerque. Check rates and book your reservations using WTA’s Online Travel Booking Service. Savings can be as much as 40% off car rentals and 65% off hotels. Santa Fe is 62 miles northeast of Albuquerque. Route I-25 runs south of Santa Fe, Routes 285/84 runs north to south through the city. Hotel Santa Fe and Hacienda Hotel - 1501 Paseo de Peralta; $99-459. Just 6 miles east of the Plaza. Seasonal Native American dance demonstrations; gift shop; heated outdoor pool; hot tub; suites; business center. (800)-825-9876; www.hotelsantafe.com. Madeleine Bed and Breakfast - $85-180. Historic building; 8 bedrooms, 3 floors, no elevator, shared and private baths. 2 night minimum stay. (888)-877-7622. Ten Thousand Waves Japanese Health Spa - 3451 Hyde Park Road; $160 and up. 4 miles from the Plaza Cottages. Marble or stone wood burning fireplaces; free communal tubs; restaurant. (505) 982-9304; www.tenthousandwaves.com. Check rates and book your reservations using WTA’s Online Travel Booking Service. Deep discounts may apply on hotel rates. Amaya Restaurant - 1501 Paseo de Peralta. Inside the Hotel Santa Fe. $7-27. (800) 825-9876; www.hotelsantafe.com. El Farol - 808 Canyon Road. $18 & up. (505) 983-9912. La Casa Sena - Sena Plaza, 125 East Palace Avenue; east of the Plaza. Over $25 in dining room, less in cantina. Selection of 1,400 wines. (505) 988-9232. Palace of Governors - 105 W. Palace Avenue. (505) 476-5100; http://www.palaceofthegovernors.org/. Plaza - San Francisco Street, south of the Palace of the Governors. La Fonda Hotel - 100 East San Francisco Street. New Mexico State Capitol - Old Santa Fe Trail, between East De Vargas and Paseo de Peralta, 4 blocks South of the Plaza. (505)-986-4589. Sena Plaza - 125 East Palace Avenue, east of the Plaza. $8-57. (505) 988-9232. Saint Francis Cathedral – 131 Cathedral Place, across from Sena Plaza. (505) 982-5619; www.archdiocesesantafe.org. Santurario de Guadalupe - 100 S. Guadalupe St., 4 bocks west of the plaza. (505) 988-2027. Barrio de Analco - East De Vargas between Don Gaspar Street and Old Santa Fe Trail. San Miguel Mission Church - 401 Old Santa Fe Trail. (505) 983-3974. El Zaguan - 545 Canyon Road. Canyon Road - From downtown drive east on Alameda Street along the river, turn south on Paseo de Peralta. Museum of New Mexico - 113 Lincoln Ave. Fee: $5; 4 day 4 museum pass: $10, (505) 476-5060; www.museumofnewmexico.org. Wheelwright Museum of the American Indian - 704 Camino Lejo, 2 miles southeast of the Plaza, (505) 982-4636 or (800) 607-4636; www.wheelwright.org. Museum of Fine Arts - 107 West Palace Avenue; (505) 476-5072; www.museumofnewmexico.org. Georgia O’Keefe Museum - 217 Johnson Street; (505) 685-4539; www.okeeffemuseum.org. Santa Fe Opera - Open-air theater. Performances only in the summer. Standing-room tickets also available. (800) 280-4654. Santa Fe Walks - 2 - 2-1/2 hour guided tours explore the history, culture and art of historic downtown, residential and art communities. Tours start at the Hotel St. Francis. Tours leave at 9:45 & 1:45. Fee: $10; over 64 - $9; children under 16 free. (505) 988-2774. Afoot in Santa Fe – 2 hours. Guided walks include commentary about the city’s history and architecture, Anasazi ruins, museums, and art galleries. Tours start from Hotel Loretto at Old Santa Fe Trail and Water Street. Run daily at 9:30 a.m. Fee: $10, children under 16 free with parent. (505)-983-3701. Art Colony Tours - Spend a 1/2 or full day at a variety of art galleries and museums. (505)-466-6146. Loretto Line - 75 minute tours that run daily on the hour from 10 a.m. to 3 p.m., April – October. Guided tours on open-air trams. 211 old Santa Fe Trail, 2 blocks east of the Plaza, at junction E. Alameda St. Fee: $12, under 12 - $6. Santa Fe Southern Railroad - 410 S. Guadalupe Street; the depot is at the corner of Guadalupe Street and Montezuma Avenue. (888) 989-8600; www.sfsr.com. Santa Fe Rafting Company - Half or full day excursions, evening dinner floats, ride the rapids, and overnight raft trips. (800) 467-RAFT; www.santaferafting.com. Sangre de Cristo Mountain Range – North of the city on Route 285. Has several ski resorts; open mid-December to mid-March, 52 runs, 5 lifts, 3 snowboarding parks. (505) 982-4429; www.skisantafe.com. Santa Fe Convention and Visitor’s Bureau, 201 W. Marcy Street. (800) 777-2489; www.santafe.org. The Santa Fe Gallery Association - (505) 982-1648; http://gosantafe.com/galleries/. Hospital - St. Vincent Hospital, 455 St Michael’s Drive. (505) 983-3361. Pharmacy - Walgreens, 1096 St. Francis Drive. Open 24 hours. (505) 982-4643. Notice: This information is current as of November 2003. It is recommended that you contact the numbers, and/or visit the websites above to determine any changes to the information.